Need a used bike? It’s at Coco’s! For one reason or another people keep asking me where they can pick up a good used bike in time for summer. Aside from the obvious that I want more people to be on bikes in LA, and that summer is an awesome time to ride a bike in LA, I do want to point people in the right direction but often don’t know where to send them. Most bike shops focus on the new stuff and resources like craigslist are hit and miss when it comes to quality/value/price especially for someone very new to the whole thing and not really knowing what they need or how much that should cost them. It’s because of this that I’m so super psyched to officially point everyone the direction of Coco’s Variety (2427 Riverside Drive, just south of Fletcher in Silver Lake). The place is run by internet superstar Mister Jalopy and this weekend I stopped by to check out their selection and he gave me a personal tour showing me exactly what they do to clean up and repair all the old bikes they have there in the shop. Differently than the other shops in town, at Coco’s they focus specifically on the older more forgotten about stuff, making it roadworthy again. This is especially awesome for a first timer because you can pick up a solid bike in fantastic condition often for less than a brand new piece of crap at Target will cost you, and it’ll last a lot longer too. My quick scan of the bikes they had for sale showed a range of $50-$300 and I guess that’s mostly where they stick. Cruisers, Mountain Bikes, Road Bikes, Kids Bikes – all of it. Super awesome. 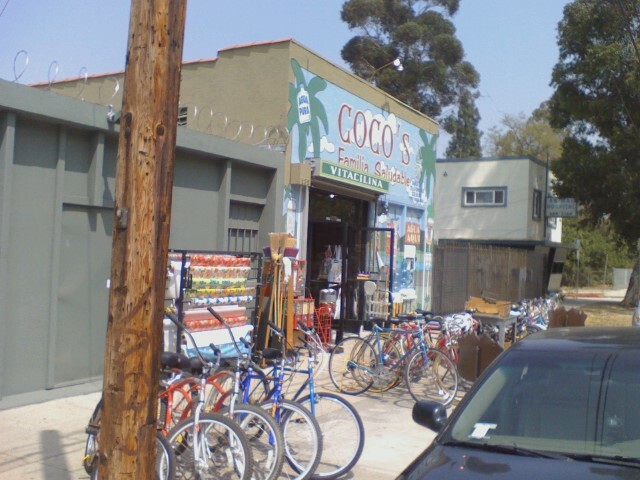 So there’s my official recommendation, if you are in the market for a used bike to cruise around on this summer, swing by Coco’s for sure. Everytime I go by there Ruth666 says “you gotta go”, someday maybe I’ll have the time to just pop in and check it all out. Just my luck that you post this after I buy a brand new bike. Though I didn’t go to Target. I do have standards. My first time there Mr. J had a gem amidst the coals set out on the streets. An aluminum lugged carbon framed Specialized road bike from the mid-1990s that he ended up liking to much to sell. Can’t blame him at all. And while you’re there for a bike, make sure to pick up a box of Hamster’s Lunch! When I went there, the nice guy working behind the counter rehabbing bikes cut down my overly long kickstand for free. Classy move. When I met Mr. Jalopy, his hands were covered in black grease, exactly as I would’ve expected them to be.